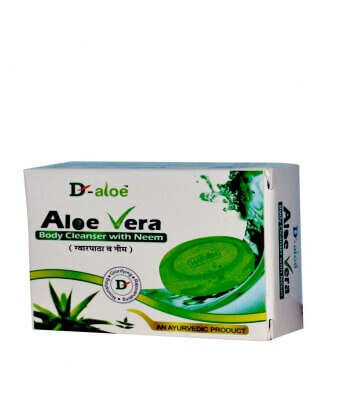 D-aloe Aloe vera body cleanser is combination of herbs to give the skin a soft and supple feel. It contains extracts of aloe vera, neem, tulsi & Glycerine. which has been used in Ayurveda for use all over the body to soothe and revitalize the skin and retain the natural moisture giving a supple, radiant and healthy looking skin & maintain natural moisture of the skin with its skin vitalizing property and natural fragrance, provides freshness thought out the day. Aloe helps combat the drying effects of antibacterial soap before it even makes contact with our skin. The natural enzymes and minerals in aloe balance out the harsh antibacterial chemicals and help to moisturize and soothe skin with each use.